Last month Munch turned 10!! Yes, I too completed a decade of motherhood. That called for a big celebration but since Munch was busy with her exams in school we had to wait for another week till we could plan something.So this tenth birthday was planned in a week.We thought of a number of themes and then settled on a Rockstar Birthday Party.Last year she had an Alice in Wonderland theme . First on my mind was that the invitations should go out as early as possible.Google proves very helpful when you are in a hurry and it worked for me too. 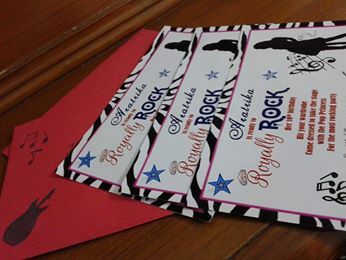 I quickly designed one with the help of Photoshop and made pink envelopes and used glitter pens to draw a guitar and some notes on it and the invites were ready to go. 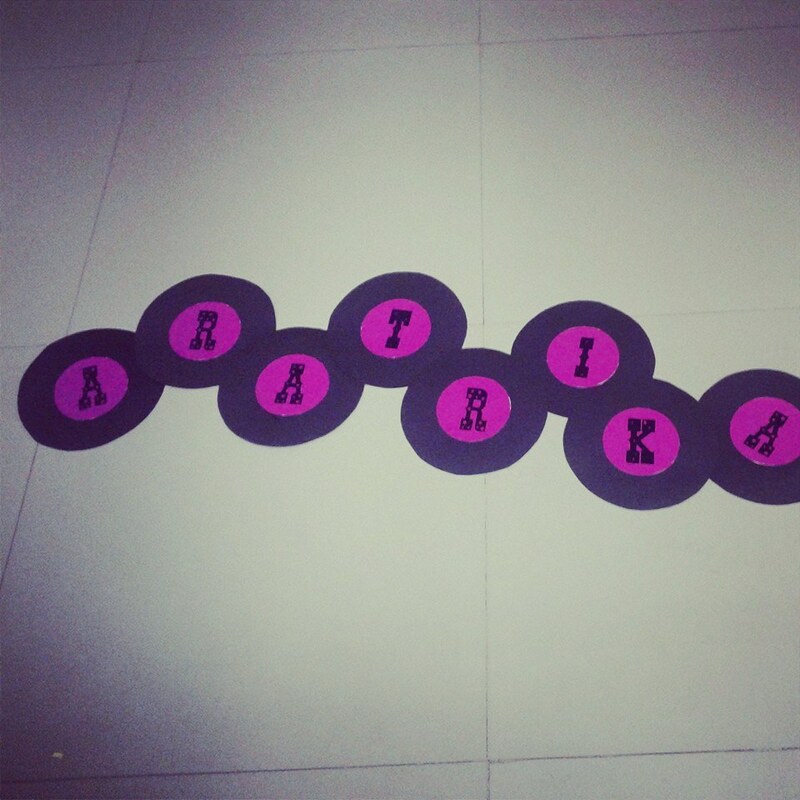 Next I worked on a banner to go with the theme and I came up with this.Simple black chart paper cut into circles and printed letters of her name in pink stuck on each made them look like LPs.Easy and Quick. 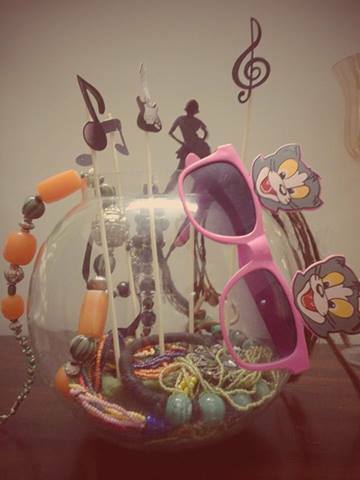 I made this centerpiece using my junkies and a few cutouts of musical notes on coctail picks. I was now full on into the theme and trying to follow it to the T..
Will be back with the rest of the preps later..
Till then..would love to know what all themes have you done for your kids birthday parties or do you like to keep it simple.Munch likes to invite her friends and have a party each time so I have to plan something new everytime . Between the two girls each year I feel I am too exhausted but once I begin there is no stopping me. This entry was posted in Babies, Birthdays and Milestones and tagged rockstar birthday party by thedotingmom. Bookmark the permalink. Antra, great planning. It all looks very well put together and beautiful! !